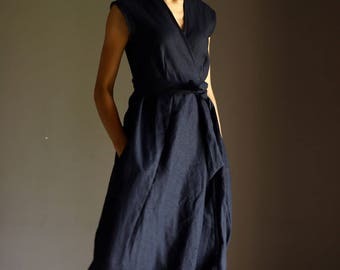 Linen Jumpsuit. Long Jumpsuit. 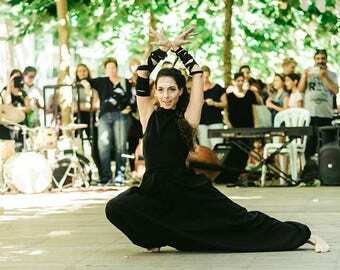 Wrap Style Black Jumpsuit. Drop Crotch Harem Pants Jumpsuit. 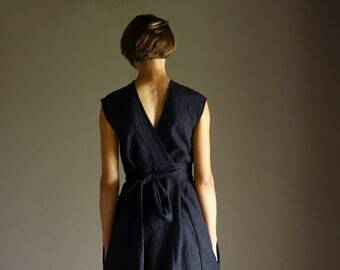 Washed Linen Overall. Linen Romper Plus Size with deep side pockets. Color: This washed linen jumpsuit is available in 31 different colors. All Shantima linen items come in a beautiful wrap, which makes them not only a lovely purchase but also a cool gift. The model (5'3'', 162cm) is wearing size S.
It was absolutely lovely. So special and comfortable. Thank you! Dieser Jumpsuit ist perfekt. Ich bin hin und weg. Er sitzt super und ist ultra atmungsaktiv! Ich werde bestimmt wieder was aus diesem Shop bestellen. Großartiges Design und ein raffinierter Schnitt! Just received my jumpsuit in autumn colour. Absolutely love it! Beautiful heavy weight linen fabric, quirky design, made to measure. Second item I have ordered from this shop. Great service and shipped quickly to uk from Israel. Thanks again. Kids drop crotch pants - Unisex Harem pants for boys and girls. Gray jersey children harem pants. READY TO SHIP. Free shipping. 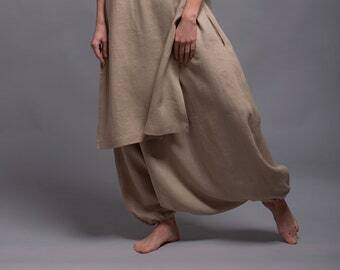 Long Men's Harem pants with pockets. 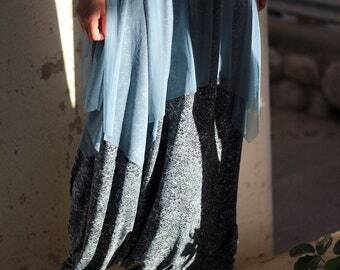 Drop Crotch, Loose fit, Baggy, Wide leg pants, Pants for yoga and meditation, Big fabric choice!